It's not that Bingley was necessarily bad; it was just uninspiring. It was a bit tired, a bit rough. The glass roof needed a scrub. The shop/cafe was vacant, and the "to let" sign looked like it had been there a while. Everything needed a bit of paint. And when you exited, you passed through an open passageway and straight out into a car park. Never too pleasing. It meant that I had to take the up the nose sign pic between a bus in a layby and a group of amused Asian taxi drivers. If I'd had a bit of nous about me, I'd have bought a bowler hat to wear in Bingley, a la the famous building society. That kind of preparation is, however, beyond me; you should be glad I'm wearing pants. 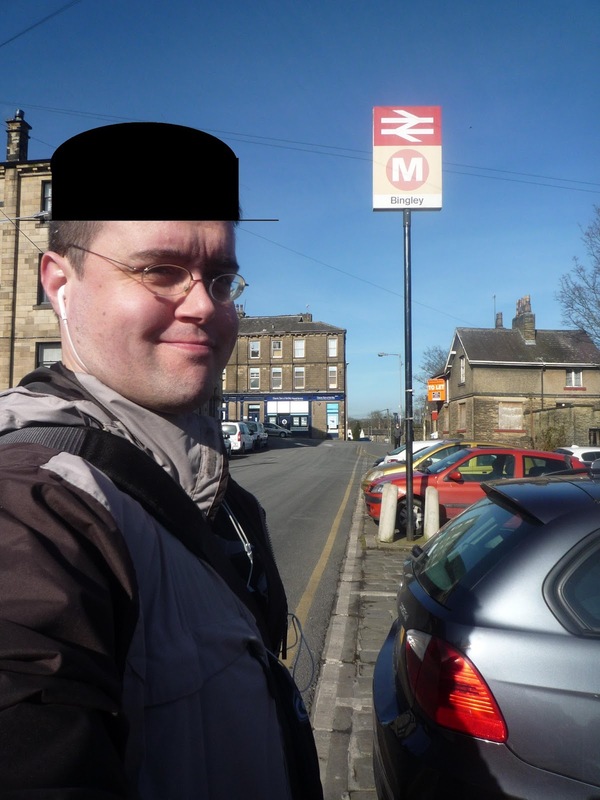 Thanks to the wonder of modern Photoshop (/MS Paint) I can pretend I did actually have a hat on. It was just a bit sad. A radiator shop has no place in a modern railway station. I suppose we should be glad the station still has a glass roof; most of them have been swept away as too much hassle to maintain. The archway down to platform 2 from the road bridge is a grubby delight, too. The Midland Railway wasn't afraid to make its presence known everywhere. I'd decided to take a prettier route towards the next station, Crossflatts, so I swerved Bingley town centre and headed away from the valley. There was a slight rise, a turn, and then I was by the canal - the Leeds and Liverpool Canal, in fact. If I'd wanted to I could have walked all the way to the Pier Head. Despite the bright sunshine and clear skies, it was still cold; there had been a ground frost when I'd left for the station that morning. Sheets of ice still clung to the surface of the canal. Glass islands for the sun to reflect off. The Bingley Five-Rise Locks; the steepest set of locks in Britain. The only way to get past the Pennines was to go up and over them, and this system of locks was designed to make that feasible. A steady waterfall flows down the right hand side and, at the left, there's a footpath. Not steps, mind; a footpath. If you look closely in that picture you can see a cyclist, who'd barrelled past me. He only got halfway up the slope before his bicycle went into revolt, nearly tipping him backwards, and he had to shamefacedly walk it up the rest of the way. I was struggling too. It wasn't that the going was hard, necessarily; it just rose very quickly, very fast. I stopped at the top for a breather. There was a man there, gazing off into the distance, not moving at all, while his mate sat close by and ate cheese and pickle sandwiches. A big lump of pickle flobbed out of the bottom and into his lap; he flicked it into the canal to treat the fish. Across the way, a cafe owner brushed down the canal edge, ready to set out wooden tables and chairs for the day's passers by. Professional looking walkers went by, people in serious anoraks with solid boots and thick woolly socks; they nodded at me, stolid, a single gesture of acknowledgement. I was passing back gardens and yards where the owners clearly had a problem with dog dirt. Every house had hand lettered signs, printed stuff with clipart, even bronzed ones with professional stencilling, begging you to clean up after your animal. It was a bit relentless. They put up with it for that view: across the Aire valley at the front, the canal behind, a one-two punch of English countryside. It didn't matter that their houses weren't thatched cottages - they bathed in Yorkshire air. I left the canalside way too soon, to find Crossflatts station. The valley has been filled at this point with the railway and the A560, a dual carriageway; the two transportation methods intermingle all the way from Bingley to Steeton, sometimes joined by the river as well for a three-way dance. Crossflatts was built in the 1980s to serve the nearby housing estate. It means that it's without ornament or decoration; as perfunctory as possible. I take back that stuff I said about Bingley. Keighley was a complete change; it was as though Crossflats was there purely to lower your expectations. While platforms 1 and 2 are for regular commuter services, platforms 3 and 4 form the terminus of the Keighley & Worth Valley Railway. Yes, it's a heritage line, so that means lots of bold capitals, lots of cream paint, and lots of lozenge signs. If I'd been there the previous week, I'd have been able to take a ride, as it was half term. Of course, I'd have hated every moment of it, wedged between caterwauling three year olds and frazzled mothers. Instead I peered over the wall. Kudos to Northern Rail, though; they haven't tried to compete with the heritage station by making "their half" relentlessly corporate. There's no purple, just carefully painted old-fashioned features. At the top, there's some wonderful tiling on the walls. Why don't we tile all our buildings now? It's so pretty, so easy to clean, so charming. Underpasses in white ceramic instead of grey concrete. Footbridges with geometric designs instead of gang tags. Although I should say I hate that font they've used on the "Trains" sign. Rail Alphabet or nothing! Ducking into the ticket office brought another delightful space, all symmetry and natural daylight. There was a quiet murmur as passengers negotiated with the man behind the counter. The automated announcements seemed muted and elegant in here. I took advantage of the mirror for another selfie, beneath the plaque commemorating the opening of the station in 1847. I missed the point that you're meant to actually be able to see your face in mirror shots. No wonder my pic on Guys with iPhones is so low-rated. Trains used to take up massive amounts of real estate in town centres - all those goods yards and sidings and maintenance yards. Today, there's little need for most of those services at all but a select few points, so railway stations sold off the land. Keighley station's hemmed in by new developments. Across from the station building, there is an Asda superstore on one side of the tracks, and a Sainsbury's on the other. Next to the station Leeds City College have built a sparkling new campus building. This made things even more awkward for the station sign picture. Aging Asian taxi drivers staring at me, I can handle: 18 year old scallies pouring out for their lunch after a morning cooped up in hot classrooms, on the other hand, are more likely to laugh, point, and possibly throw things. I snatched the photo as quickly as possible and rushed away. The students were everywhere, flowing all over the town centre. I was skirting the edge but they seemed to be in every shop, barrelling out of side alleys, wolfing down chips in cafes and pizza bars. Avoiding their whirring footsteps became a full time distraction, meaning I might have missed some of Keighley's more beautiful spots. There was a very nice multi-storey car park - shhh, it was great, with twisted columns - and a public library with a Charles Rennie Mackintosh-esque sign over the door. Mostly it seemed like hustle and cars; I twice had to dodge taxis swinging into my path on cross streets. After a bit of walking, though, things became less frenetic. A road out of town meant villas and detached houses, plus small worker's cottages plunging down the hill towards the river valley. The pedestrians thinned out until I was the only walker, occasionally avoiding someone at a bus stop, but mostly having the pavement to myself. That under-construction mosque is two doors down from a Christian Science church; I'd have loved to have seen their reaction to the planning application. I'm just glad it's a proper mosque with a decent dome and minaret. Sometimes new-build mosques look like an Asda, and the one in Birkenhead is just a couple of rooms above a shop. Go large or go home, I say. Walking on that ridge above the valley, I felt content. It was hard not to enjoy the bursting spring around me, soft curls of green creeping out of branches and leaves. There were patches of snowdrops, still in amongst mud and wet grass, but promising so much. Utley, the next village, was ordinary but in a lovely way. It wasn't trying to be more than it was, but was happy to be a decent place to live. A dog stared out a window at me as I walked by, following me as I passed, and I found myself waving at him. I'm not sure why. If he'd waved back I'd have been terrified. There were sheep grazing in some of the fields, but no lambs yet. I'm not sure when they'll start turning up. They've already appeared alongside the daffodils and the Easter eggs in the springtime displays in the supermarket so we must be due them soon. According to a plaque at the side of the road, Steeton with Easton is the home of the Steeton Male Voice Choir (which begs the question: where else would you expect to find them?). I hunkered down, just in case I was suddenly accosted by a gang of men doing Amazing Grace in harmony. It was another pleasing village, though one of the pubs at the crossroads was up for sale. I briefly allowed myself to fantasise about owning a small pub in the Yorkshire Dales, before realising that I actually hate (a) people and (b) hard work. I think I basically want to own a hand pump full of ale; the pub is a secondary consideration. A right turn and I was heading out of the village, past the Steeton Hall Hotel ("Hotel of the Season Winter 2012/13", which is not much of an accolade to be frank) and the Millennium Business Park and to Steeton & Silsden station. This is yet another station that Beeching closed, only for it to be reopened twenty odd years later. I'm starting to feel a bit sorry for the old sod. Every decision he made seems to be slowly being overturned. It means that the station building isn't in use for railway purposes any more, but it does mean that it's a clean and modern facility. I stood on the platform and ate my peanut butter sandwiches (I'm trying to save money by bringing them from home; it's why I also gave the pub in Steeton a swerve, even though every fibre of my being was calling for a pint). This was as far as I could get on my West Yorkshire Day Ranger; I'd need a far more expensive ticket to get to Cononley and Skipton, further on. It was a good, satisfying journey out, and I was glad to do it all over again. I'd worried that I was losing my blogging inspiration, my mojo - I'd just not been able to get the effort (or the cash) to go out there. A day on the railways reminded me what I was missing.